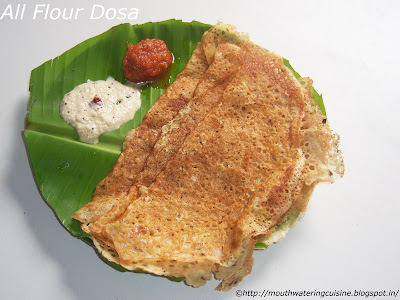 All Flour Dosa a new variety dosa. We call them Pitchatlu true meaning is silly dosa, as it is made by adding any three or more flours. Normally we made them with wheat flour, maida and all purpose flour. I added two more i.e. suji and besan also. They are best accompanied with coconut chutney and Onion Chutney. They look like rawa dosa only, but they are not as crisp as rawa dosa. They are soft and tastes good. Take all the ingredients in a huge bowl and mix them well. Add water to it and make thin consistency batter. Once the batter settles water will come up. 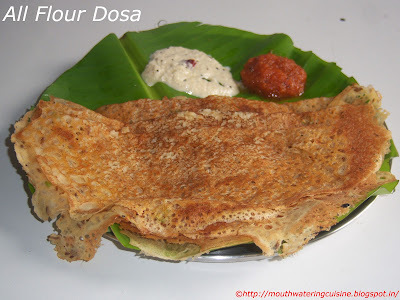 The batter should like that of Rawa Dosa. Heat tawa, pour the batter in a circular motion with a small tumbler. It should be poured from outward to inward. Pour one spoon oil on the dosa. Fill the gaps of dosa with a little oil on them also. Cook the dosa for 2 minutes or till the dosa turn to golden brown color. Repeat the same to make desired number of dosas. Serve it with coconut chutney and Onion Chutney.